Welcome to SK Gurukul Sangeet Pathshala! We feel immense pleasure welcoming you at the official website of Shree Krishna Gurukul Sangeet Pathshala (aka SK Gurukul). SK Gurukul was established in 2061 B.S. (2005 A.D). Since its inception, it bets in the quality music teaching and excellence, focusing on the practical lessons and theories of eastern classical vocal music and has maintained the image of quality classical vocal music pathshala in Kathmandu. SK Gurukul Sangeet Pathshala was founded by Classical Vocalist Sri Tilak Singh Pela, who hails from Baitadi District of the far-western Nepal. Musical learning he has been imparted with is an amalgamation of some of the remarkable gharanas of Hindustani Classical Music such as Banaras Gharana, Agra Gharana, Gwalior Gharana and Mewati Gharana. Sri Pela has received Sangeet Praveen in Classical vocal and has been conducting vocal music classes at SK Gurukul since its inception (please see our Gharana Chart to trace our musical lineage). 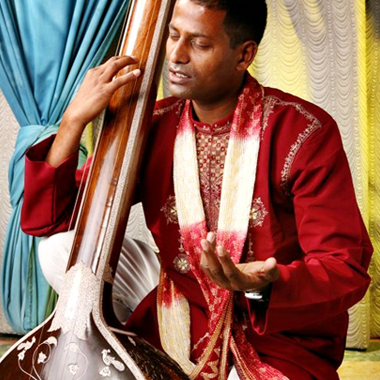 He is a disciple of Sangeet Praveen Dhan Bahadur Gopali and Pt. Devashish Dey, both of them are eminent personalities and noted classical vocalists. We have always been guided by the vision and musical learning imparted to us by our respected Gurus and we believe that good music needs great deal of commitment and dedication. That’s why we train our students to go through strong commitments and higher level of dedication since the beginning of every session. Our music teaching program caters for motivated students of all ages and backgrounds, from beginners to professional levels. We are aware that a good education is the first step to build up a solid career in music, with all the expectations. After completing the vocal training from SK Gurukul, the students will have acquired theoretical and enough practical knowledge to pursue a more solid and lasting career in music. The music teaching at SK Gurukul is based on Guru-Shishya Parampara, which has been the most effective teaching tradition in Hindustani Classical Music. 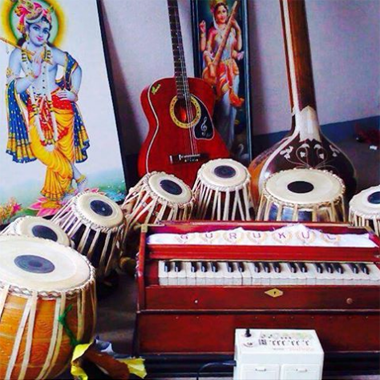 Currently, SK Gurukul offers Classical Vocal and Tabala courses from Junior Diploma to Sangeet Praveen level, affiliated to Prayag Sangeet Samiti, Allahabad, India. We take personalized care of every students so that they will get equipped with sufficient insight to properly shape their journey in the classical music. Anyone who visits our Pathshala falls in love with its unique and spiritual ambiance. If you are in search of good music school that takes care of your needs and offers specialized classical vocal training, then you are at the right place. Show us your commitment and dedication, we will show you how you can excel as a good classical vocalist. We don’t require them to have prior knowledge of music but an unending determination, commitment, patience, dedication, devotion and regular effort to learn music. We cordially welcome all the classical music lovers at SK Gurukul to receive quality training of vocal music and tabla. You will get to learn classical vocal music under the auspices of Sri Tilak Singh Pela. Come join SK Gurukul today and feel the divinity of music! SK Gurukul is one of the dedicated classical vocal music schools in Nepal. It has been serving to the Nepalese Classical Music arena since last 12 years and has always been striving to offer quality music education. Copyright © 2018. SK Gurukul Sangeet Pathshala | Scholarship Theme by Mystery Themes.